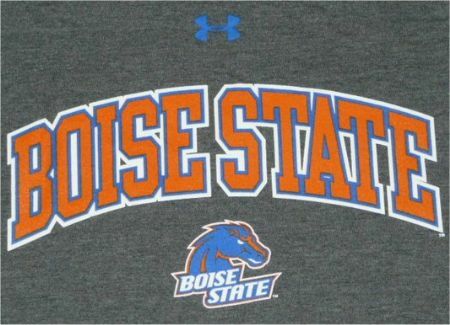 Authentic adult Under Armour Boise State Broncos Tech Shirt. Soft Comfortable relaxed fit. High Quality Boise State screen print. Color: Carbon Heather HIGH QUALITY/DENSITY Screen Print Under Armour Tech Stretch Fabric RELAXED FIT Boise State in arch block font Under Armour tag on the back.